Editorial Abril did print many books in their serie "pequenos grandes libros". These are indeed very small big books. They are around 8*10 cm but with 280 pages! Many comic heroes are represented. 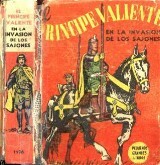 And in book 1196 Principe Valiente is presented with "en la invasion de los sajones". Printed in august 1949! And therefore the oldest PV book in Middle and South America. Very rare and valuable. Value is around 60 USD.